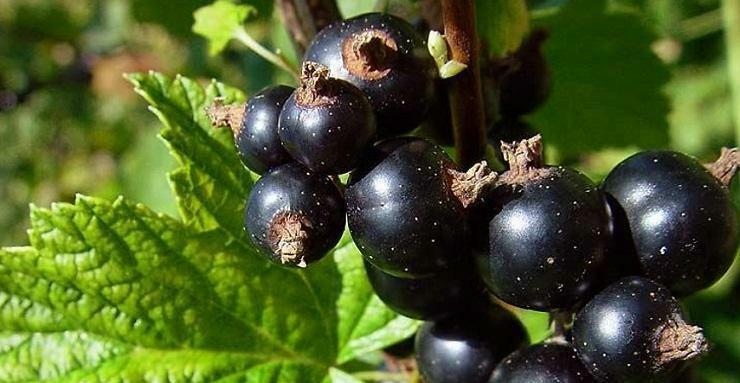 The blackcurrant (Ribes nigrum) is a precocious rustic species, with a high biological potential, capable of producing around 5 to 8 tones per hectare. This species grows spontaneously in Europe’s mountainous areas (The Alps, The Carpathians), in Asia and North America. During the first 2-3 vegetation years, the blackcurrant will have a small production quantity. After this period, the shrub will reach its full production potential. The blackcurrants are an important source of nutritious elements. These have: sugars, organic acids, sodium, potassium, calcium, iron, fibers and vitamins (A, D, C, B6, B12). 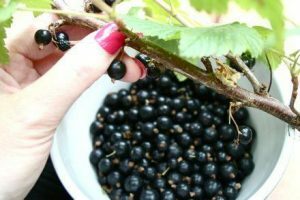 The blackcurrant is a shrub which has a vertical growth, with 15-25 stems of different ages, with a height of 1-1.5 m. Inside the soil they grow a root system with many side branches, 15-20 cm long. The superficial growth of the root system implies careful maintenance procedures, so that the roots will not be wounded. The stems grow vigorously during the first years, then their growing intensity is reduced. The young branches have fine little hairs, of a grey-red color. These also have small glands which produce an intense, specific scent. The sprouts are 5-8 mm long and have an oval shape. The leaves are long, with petioles, covered by hairs, with serrated margins. The flowers are grouped into raceme typed inflorescences. The fruit is a black colored berry, which can grow up to 20 mm. The shrub will blossom in April-May, the fruits will mature in July. The pollination is done by insects (entomophilous). 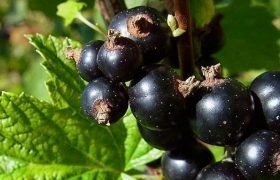 The blackcurrant shrub will withstand semi-shadowed spots, but its full biological potential can be reached if it is exposed to full light (no fog, smoke, dust, nebulousness, etc). The best results can be reaches in areas where the annual average temperatures is 7.5 to 8.5 degrees Celsius. During the vegetative rest period, it can withstand temperatures as low as -28 degrees Celsius. High temperatures will harm the blackcurrant. The shrub will lose its leaves at 30 degrees Celsius, the fruits will prematurely ripe, but will remain small and fall off. The shrub has high water demands. It needs a minimum of 700 mm of rain per year. 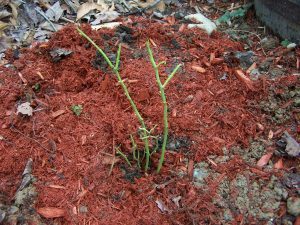 The soil this shrub likes needs to be fertile, deep, with a clay texture and well drained. Pick a soil which is compatible to this shrub’s climatic requirements. The parcel must be placed at a minimum distance of 500 meters from active ways and at a minimum distance of 15-20 km from the industrial pollutants. The parcel’s inclination must not be higher than 10-15%. The best predecessor crops are the annual legumes, or the perennial ones (peas, beans, alfalfa, clover). 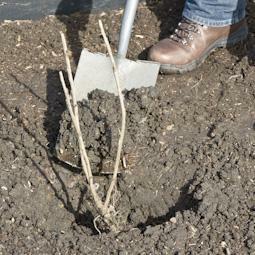 The soil must be prepared with a minimum of 60 days before the planting process. Of the soil has been heavily infested by weeds, the following herbicides can be applied: Roundup Classic, Roundup Energy. A week after applying the herbicides, the base fertilizing process will have to be carried out, using 50-6- tons of organic compost, or 500-600 kg of complex NPK fertilizer. After fertilizing it, the soil will have to be ploughed at a 30-40 cm depth, then minced and levelled. For this process, you can use the hoe, cultivator. The soil must be disinfected before planting. You can either use Basamid, or plant rapeseed, mustard or tagetes a year before planting the blackcurrant. For the areas where the climate is temperate, the optimum planting period would be the end of October – the first days of November. If you want your planting process to be precise, the parcel can be marked, where each shrub should be. The recommended planting scheme is the following: 3 meters distance between the rows and a meter distance between the plants on each row. The holes need to be dug the same day (as planting), or a few days before. The holes must have the following dimensions: 40 x 40 x 40 cm. The holes need to be dug near the stakes used for marking the parcel, without moving it. The planting material needs to be purchased from certified nurseries only, or from authorized research points. Mix the soil resulted from digging the holes with organic compost and put this mixture at the base of the holes. The seedlings must be planted in such a way that the entire root system will be inside the hole, along with 5-6 cm of the stem. The soil needs to be well pressed around the shrub. At the end, water the seedlings properly and form an anthill around them, which should be around 8-10 cm high. After planting, or during spring, the seedlings need to be shortened to 10-12 cm, so that only 2-3 sprouts will remain above the anthill. The soil surrounding the shrubs can be covered using a hay based organic compost. The mulching layer will keep a constant soil humidity around the roots, it will balance the temperature within the soil, ease the microbiological activity and it will reduce the number of maintenance procedures which needs to be carried out. During the first years after planting, the cuts destined for forming the foliage will have to be applied. This must create a shrub which will be able to bear fruit starting with the third vegetation year. Every year, the blackcurrant shrub will form sprouts at the base of the stem, next to the soil, the largest productions will be obtained from the branches which grew during the 2nd and 3rd year. During the second year after planting, the stems will have to be shortened to 3-4 sprouts. The weak or wounded growths (as a result of the frostbite, or diseases) will have to be taken out. During the spring of the third vegetation year, you will find 12-15 new branches, which grew out of the sprouts which were not cut. These branches must be shortened by 20% or their length. For example, if a new branch is 50 cm long, after cutting it, it must be 40 cm long. The same must be done to be branches which grow at the base of the stem, near the soil. This way, the shrub will develop normally until autumn. During the fourth vegetation year, pick 18-20 healthy branches (of different ages) and cut off the ones close to the soil. The small and weak vegetative growths must be taken out by cutting them above the sprouts which are oriented towards the exterior of the shrub. This way, the branch that will grow from the sprout, will replace the branch that was cut off. The applied cuts form the following years will have to air and rejuvenate the shrub. Take out the ill or dry branches and the ones that are older than 4 years. Pick 18-20 healthy branches, aged 1 to 3. Shorten these branches by a third of their initial length. During the first years after planting, the crop must have the placed between the rows cleaned, by mulching and ploughing periodically. 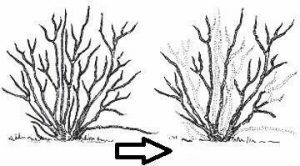 Carry out these procedures carefully, not to harm the shrubs’ root systems. Starting with the third vegetation year, the parcel can have herbicides applied. The following herbicides can be applied: Pantera, Leopard, Fusilade, Centurion. The space between the rows can be planted with white clovers (Trifolium repens). This species will not be the blackcurrant’s direct competitor when it comes to water and food. The irrigations are important for the areas where the rains that fall will not exceed 700 mm per year. Normally, the crop needs to be watered 4-5 times, using 400-500 cubic meters of water per hectare. Sprinkler or drip irrigations are recommended. To reach its full production potential, the plant needs extra fertilizing. Apply around 30-40 tons of well decomposed organic compost once every 2 years and 30-40 grams of complex NPK fertilizers per plant. The optimum period for applying the fertilizers ranges from November to February. The fertilizers must be incorporated into the soil by ploughing the soil at a 10-15 cm depth. Leaf fertilizers can also be applied, using Terra-Sorb, Amalgerol or Cropmax. The plant’s phyto-sanitary condition is very important. The blackcurrant can be affected by a large number of diseases and pests. For more information about the diseases and pests which affect the blackcurrant crop, as well as the proper prevention means, please click here. 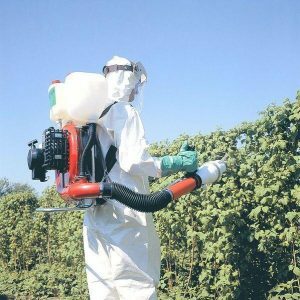 Crop hygiene is one of the means of preventing the appearance and development of diseases and pests. This consists of cutting, gathering and burning the dry branches and sprouts and incorporating the fallen crop leaves into the soil by ploughing. The crop hygiene procedures need to be carried out during the plant’s vegetative rest period (winter). 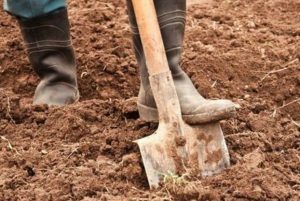 By doing this, the diseases and pests that spend the winter on the vegetal residues from the surface and of the soil and on the ill branches, will be destroyed. For easing these maintenance procedures and the harvesting process, we recommend supporting the shrubs. The best system is the ones formed of trellises and wires. The trellises need to be placed on a straight line, 8 meters distance from one another and 60-cm deep. Attach wires to these trellises, as these wires will support the shrubs. The blackcurrant needs to be harvested when the fruits from the tip of the bunches are green to red (pre-riped). The fruits are normally getting riped from the base of the bunches towards the tips. The harvesting process will have to be carried out during chilly and dry days and the fruits will have to be immediately stored in small packs (5 kg max). the blackcurrants which have been harvested at the correct time can be stored inside cool rooms/warehouses for 10 days. inside atmosphere controlled warehouses, the fruits can be stored for 35 days.